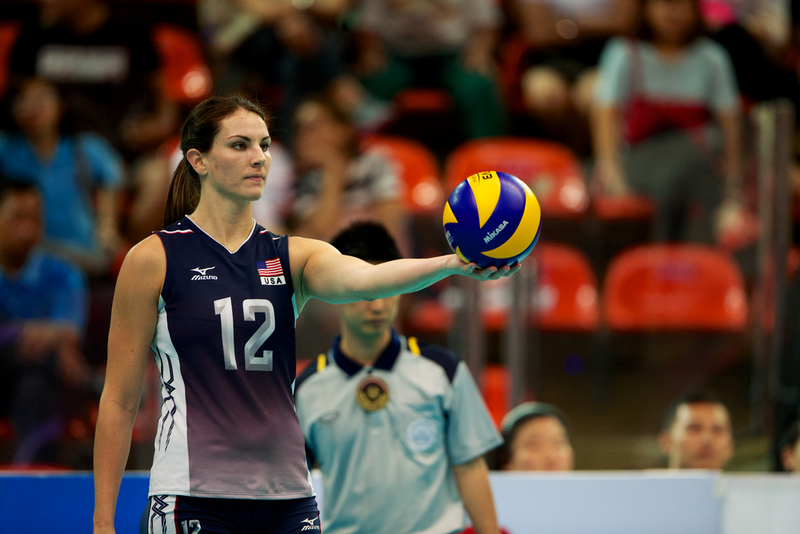 Volleyball serving drills help players become more consistent and accurate with serving. Simulating game-like pressure in practice is important for developing great serving skills for winning volleyball at a high level. Warm up your arms and work on serving the ball flat. After you serve a ball in, serve the next ball harder. As long as you serve the ball in, keep serving the ball harder. Keep serving the ball harder than the previous one before. Eventually you get to the point to where you are serving the ball so hard, it won't land in. You’re working on discovering where your limit is. How hard are you hitting it? What’s your limit to how hard you can serve without serving the ball out? When you go back and serve an ace, that serve is good enough. Stay with the serve that you were able to ace your opponent with. There's no point in serving harder if your serve is so tough your opponent can't pass it. This is a wash drill where you have to win both rallies to win the point. Serves that are below 32 miles an hour is one point. 33 to 36 miles per hour is 2 points. 37 to 40 miles per hour is 3 points. Above 40 is 4 points. You can choose your own unique scale points for your team. That’s what the serving team is playing for. The receiving team gets a point when they win the rally. The drill starts with a serve. After the first rally is finished, the free ball will go to the serving team and the rally is played out. Also, to add more to this drill, you can create point values for the passes of the receiving team. For example, if it’s a 3 pass and they win both rallies, they could win 3 points. So, both teams have the chance to win equal points. This becomes a server vs passer game. So in the beginning, the serving team has the advantage because if they serve a 40 mile per hour ball, they are playing for 4 points while the receiving team is playing for only 1 point. Passers are competing against each other. If you win, you move up. If you lose, you move down. The best passers have to fight to stay up at the top court or they will get knocked down the ladder. If you get knocked down, you have to work your way back up there. Have 2 people serving, 2 people passing, and 1 target on each court. Each server serves 5 balls. Passers count how many out of 10 are good passes (good passes are passes that end up within 8 feet of the net). After 5 serves, the passers and servers rotate. After rotating 5 times, everyone on the court as served, passed, and been the target. Compare scores. Top 2 players move up, middle person stays, bottom 2 players moves down. Volleyball serving drills need to be good at creating competition for serving and passing under pressure. And you have the players at the top of the ladder fighting to stay at the top. Spend 15 or 20 minutes once a week to do a passing ladder. Six balls "in" the court in a row (players serving one after the other). This is a team serving drill. Next, every serve to zone 1 and 2 for 6 in a row. Next, every serve to zone 4 and 5 for 6 in a row. Next, make it tougher by focusing a one zone. Another thing to do is require every serve to float. Or require every serve to be over 30 miles per hour. In a row is game-like pressure. You could also do 6 vs 6 competition of how many in a row can you get. The receiving team is trying to sideout 3 times in a row. The serving team is trying to win 2 rallies in a row. So, the serving team wants 2 in a row while the receiving team is trying to get 3 in a row. The same server keeps serving until one of those 2 things happens (3 sideouts in a row or 2 serving rallies won). When “rallies won in a row” is achieve, a point is awarded and the other team gets to serve. Teams don’t rotate. Set a timer for 3 minutes. When time is up, players then rotate positions.